Westbrook, Maine Dairy Queen Makes Record-Breaking Donation to BBCH! – Dairy Queen Corp.
Westbrook, Maine Dairy Queen Makes Record-Breaking Donation to BBCH! 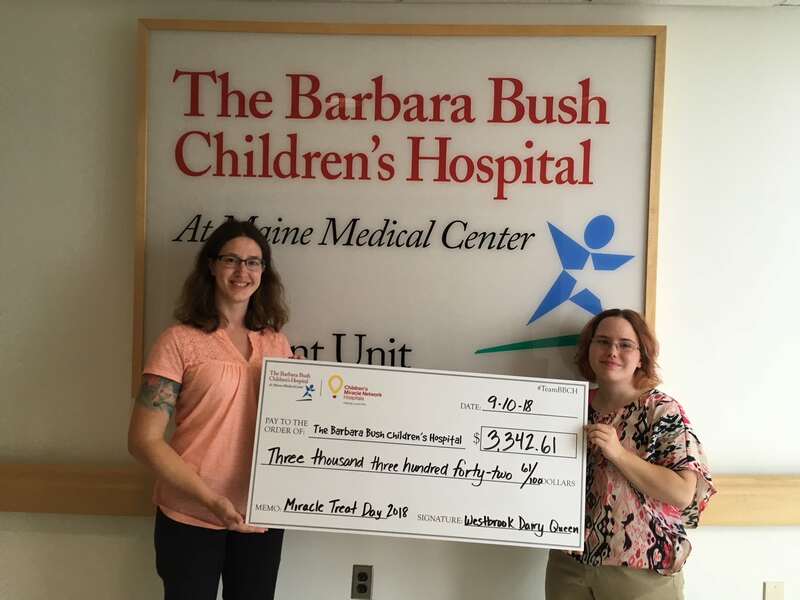 The Dairy Queen Grill & Chill located at 272 Main St. in Westbrook, Maine has always shown a commitment to The Barbara Bush Children’s Hospital that goes above and beyond. Simply walking into their restaurant on Miracle Treat Day will bring a smile to your face because the restaurant will be decorated floor to ceiling and their hard-working staff will be dressed in costume. 2018 has proven to be a banner year for fundraising efforts at the Westbrook Dairy Queen. Earlier this month, Westbrook DQ presented a check for $3,342.61 to staff at The Barbara Bush Children’s Hospital. This impressive fundraising total is the result of an incredibly successful Miracle Treat Day in August as well as Miracle Balloon icon sales at the DQ Grill & Chill. This year, restaurant owners, Bob, Greg and Rachel committed to doubling their contribution from $1 per Blizzard treat sold on Miracle Treat Day to $2 per Blizzard treat sold. As if that wasn’t impressive enough, the store attempted Miracle Treat Day pre-sales for the first time ever resulting in 116 Blizzard’s pre-ordered by area businesses. The Westbrook DQ is a true partner of The Barbara Bush Children’s Hospital, doing all that they can to ensure that the children in our community are well taken care of. Thank you Westbrook DQ!